It's time to conquer the chill and look fabulous whilst doing it. We've revised the cut for a more dainty design to complement the femininity of women. 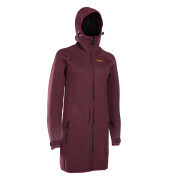 The warmest drysuit on the market includes features like a Storm_Whistle and Re-Flective prints, for optimum safety. The final touch is the rigorous testing oft he water proof Diving Drysuit Seams each suit must surpass before leaving the factory. Don't let ice cold temperatures get you down, with the ENVEE we guarantee you'll be leaving the water warm as toast and with a smile on your face. The Storm_Whistle®! This incredible whistle is twice as loud as any other mouth-blown whistle in the world and even the US military, special forces and the police is using it. And the best thing is it even works in and under the water due to its patented harmonic chamber creating the extreme 3150 hertz frequency sound. Visual safety feature for the ENVEE drysuit: Being out on the water in cold winter time can be seriously dangerous especially because it is getting dark much earlier. In case of an emergency you now can rely on additional reflective prints on the shoulder / hood area, which makes it a lot easier to be detected by SAR crew searchlights. Only super flexible SEAMTITE® Latex_Cuffs by the premium brand SPECIALISEDLATEX are used for the ENVEE drysuit on the wrists and ankles to prevent water leaking into the drysuit. The neck cuff is made of super soft and stretchy Neoprene with Glide_Skin inside similar to our Onyx models to improve warmth, wearing comfort and avoid choking. Premium brand TIZIP Master_Seal® zipper prevents water from leaking in and makes the ENVEE drysuit highly waterproof for above-water sports like kiting, windsurfing, surfing, SUPing, etc. This VISLON quality tooth construction provides a smooth low-friction losing/opening and keeps out the water effectively. It is also much more flexible and needs less lubrication than other zipper types.